This traditional Japanese embroidery study group learns the techniques used for embroidery on kimono and obi. 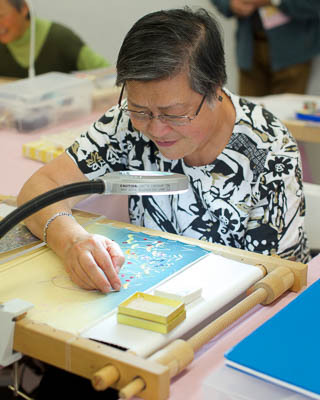 These embroideries are silk on silk with some techniques unique to Japan. Designs are from Japanese Embroidery Center in Atlanta. Classes for study are available in San Francisco and Sacramento area. Stop by Classroom 2 at the JCCCNC on the first weekend to catch these artists in action! !